← Are You Indian or American? These days I think churches are fighting the perfection complex. The idea that we only want “people like us” who live perfect lives on the outside. I wanted to throw up. 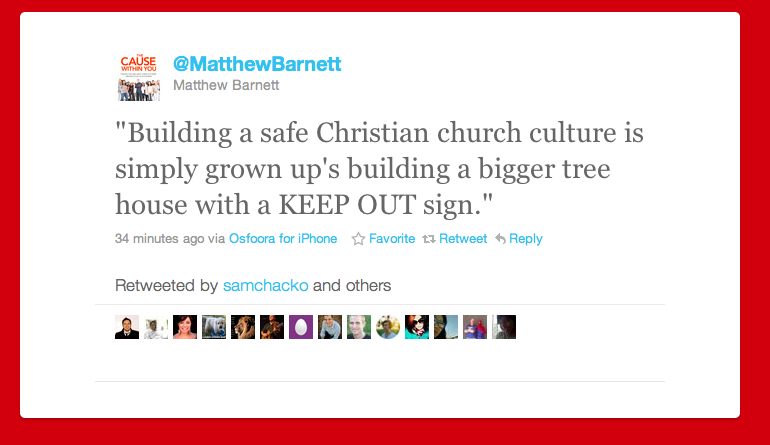 I think today traditional churchgoers are moving toward stopping the pretending. They know their own lives are dysfunctional live everyone else’s. We all need help. I work at a charity where neighbors come in every day to get food and clothing for their families. One woman told me how she got tired of nothing in her life working out. Her mom was sick and her sister had MS. When her son got cancer, it was the last straw, and she almost lost it. One day as she argued with her husband she just left the house. She didn’t know where she was going. She just wanted to go to church. She drove around searching, still in her house clothes, with a voice inside telling her no one would accept her looking the way she did. She was used to not being accepted. She arrived at the church. As she turned the doorknob into the sanctuary, the voice taunted her again. But she spoke out against it and was so hungry for something more. God started speaking to her. She started to see her circumstances in a new way and somehow discerned that she didn’t have to worry anymore; God was in control of everything. The people in that church warmly welcomed her when she most needed it. I hope all our churches can respond with warmth and welcome for that desperate person in need. Because we’ve all been there or will be. This entry was posted in Churchiness, You're Human. Bookmark the permalink. I wish deacons would be beacons, churches would be havens, believers would be relievers and Christians would be Christ-like.